There is a need for a more sustained, radical critique of the way different myths are produced about incarceration which preclude the possibility of challenging imprisonment as the dominant form of regulation and control of criminality in today’s society. The rehabilitation myth is becoming increasingly aligned with the notion of the cultural or creative industry. Prisoner artwork has its own, very specific form of cultural capital which, we might argue, actually precludes the very myth of rehabilitation since the art itself is interesting because of where it was produced. One of the foyer spaces in the Royal Festival Hall has been given over to an exhibition of artwork produced by those in incarceration, detention or secure units. Foyer Space as what Marc Augé might call a non-place turned into interior/exterior/other space. 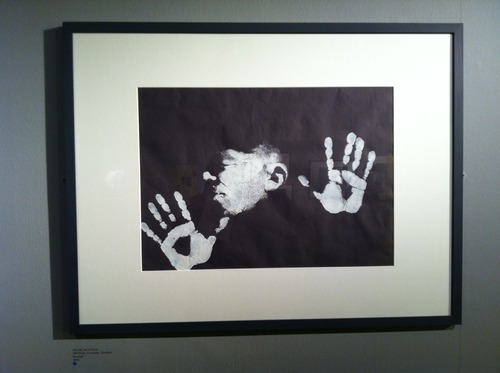 This is part of the Koestler Trust’s Offender Artwork awards. The decision to show artwork by all those in some form of detention is not unproblematic and perhaps requires further debate. However, it is also perhaps a well-intended (if not deeply condescending) attempt to remove the different types of judgment and stigma associated with the different reasons for locking people up and the value of their artwork as related to these reasons. Art as therapy, art as rehabilitation, art as resistance etc. The exhibition was curated by Speech Debelle for no apparent reason other than that she is a cool, edgy rapper – as the video of her selection process demonstrated, the logic and choices as to how to set out the exhibition were arbitrary at best. As it also turns out, those who produced the artwork did so prior to the Koestler Trust’s decision as to the theme of the awards which was ‘forgiveness’. There seems something deeply infantalising about entering artwork into a competition without giving artists any indication as to what the stakes of the competition are. I also wonder whether all the artists entered were even asked if they wanted to take part. The exhibition also provided inmates with the opportunity to act as guides and attendants. It is unclear whether they were paid for this or if this signifies further extension of the culture industry into the space of the prison via the unpaid internship involving little interesting or valuable experience. ‘I think it is an insult to the prisoners and other entrants to the Koestler that they had no idea of the theme of the exhibition. What about all the excellent work with nothing to do with the cliche of strength and vulnerability that is not given a chance to be exhibited? Where is all the pottery, the soft furnishings, the woodwork, matchstick work that prisoners spend so long doing? The most interesting artwork in the exhibition had less to do with forgiveness and other sentimentalising and more to do with the possibilities of a self-representation which reproduced the alienation of incarceration itself, setting oneself at a distance whether this be fantasy, humour, material and so on. If such work reproduced certain cliches – this is not a failing but a statement in itself as to the power of certain images and aesthetics of incarceration and the impossibility not to engage and identify with these. Alienation as belonging.